Tracy McMillin is one of the most successful and experienced goalies in the US and therefore the whole world. 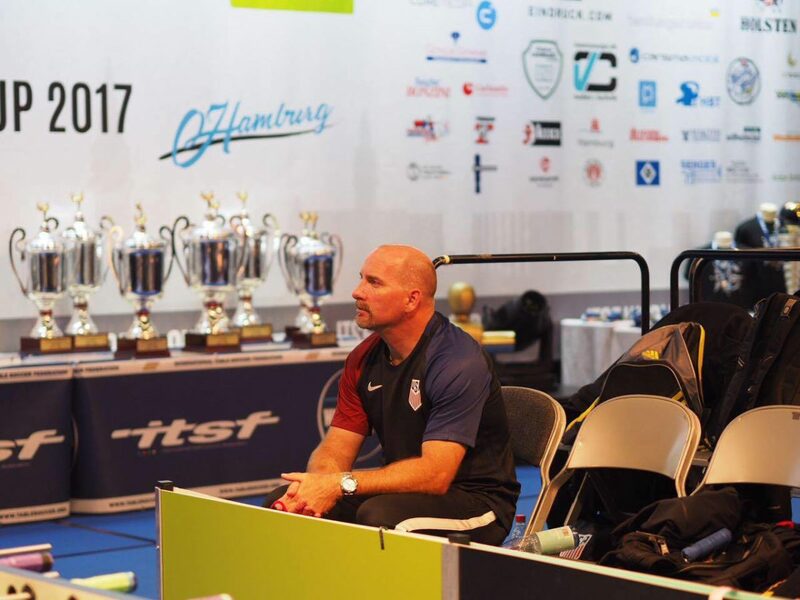 He is part and parcel of the US National Team and together with his long-term partner Dave Gummeson a serious contender for the title of every tournament they play together. No matter how tough the situation, it seems, as if Tracy always keeps his cool and just plays even better when the pressure rises. His pull shot may not seem as flashy as others on first sight. But if you compare goals or good clears on important points versus turnovers and errors, you will have a tough time to find a better ratio than the one of Tracy. A key component for his success is his analytical approach to the game. This helps also defensively, as opponents always seem to have a tough time scoring on Tracy the longer the game goes. Therefore, I am glad to present you this insightful interview. I started playing in 1984 in a recreational centre where you could play darts, pool, foosball, etc. Foosball fascinated me the most from the start. I like the sound of the ball going into the goal and the intensity of the game. At that centre, nobody really knew how play the sport and the tables were no official tournament tables. One day we went to the movies and there was a game room next door with real Tornado tables. As we played there more and more, we got invited to a regional weekly Tournament by Dave Courington, who was a big promoter of foosball at that time. He told us, that the tournaments are for free, but we could qualify over a ranking system for a $ 1000 tournament. AS we were kids, this got us hooked, and participated regularly at those weekly tournaments. It was intriguing to see, how strategical you could play foosball and how many different styles and ways there were to success. In Houston, we had almost 20 professional foosball players which was a lot for this small region. Therefore, you had a lot of input to learn from and emulate for your own game. The best team at that time was definitely John and Daniel Smith (“Smith Brothers”). Just by watching them you could learn so much about energy, intensity and body language during a match. Also, watching their execution of passes and shots you had a lot to emulate and get better. No matter which tournament you played, the “Smith Brothers” were always the team to beat and this was the goal and dream we were chasing after at that time. But I also talked a lot with other players about foosball to get better. Those weekly tournaments with those other professional definitely brought a lot of valuable experience that started my foosball career in a good way. Are there general concepts for defensive and offensive play and how would you describe them? In the defence my goal is to dictate what the opponent is going to shoot. There are two fundamental parts of any shot or pass. You have to figure out when and you have to figure out where the opponent is shooting or passing. I think the majority of the players focuses too much on where and too less on when to shoot. Therefore, a lot of players shoot at similar counts during a possession. It is not like I count from 1 to 10 every time my opponent has the ball on his three bar. But I develop a feeling for his timing. Does he like to shoot early in the count or late in the count? Does this change in pressure situations? Those questions help a lot for defending. Another thing are tendencies of your opponent. Where does he like to shoot? What is his bread and butter shot? What shot makes the opponent uncomfortable? Especially under pressure, make the opponent hit a shot they don’t like. To do that you need a plan for the game. Start out with assumptions of your opponent and test them with your defence. For example, you could test, if the opponent is able to time a shot or if they have trouble shooting on a shuffling defence. If an opponent has a very strong shot, you can take it away permanently with one man and play games with the other. Mess with his head a little and notice the reaction. After you have taken away their bread and butter shot for a couple of balls, maybe they become blind to that option. Then on an important point you can wait for their preferred timing and move your fixed man back into action and suddenly it seems as you are covering the hole goal. If the plan doesn’t work, then change it. Against good players it takes more than one match to figure out a weakness in their game. Therefore, you have to remember what happened last time against certain opponents and adapt accordingly. For the offensive part I try to isolate a man of the opponent. When I look at the defence of the opponent I try to get him to jump to a certain hole, when I am shooting. Even if the opponent already covers a hole it can be useful to shot at that hole. This keeps him hones with his defence and makes him respect certain shots of you. As in the defence you try to dictate where the defender hast to be. For example, Dave Gummeson has a deadly straight shot on the three bar. He can time it perfectly and has multiple different options for that shot. Therefore, all his opponents sooner or later have to respect that which leaves the rest of the goal covered by one man. What I play out of the back depends on my partner. If I play with Tony Spredeman or Ryan Moore I would only need to dump and clear the ball. They will get enough pickups out of the game and I usually don’t even have to risk shooting on goal. Dave for example wants me to shot more like 70% on goal and pass or clear around 30%. It really depends on your preference, the opponents and the specific situation. A good advice for clearing the ball out of the back at a high percentage is shooting at the opponents’ defender. If you do that, a lot of good things can happen. If the opponent jumps, you score a goal. If the opponent stays, your forward can retrieve the rebound. It works oftentimes because the opponents forwardneglects the holes more often. What was your biggest success and your worst defeat? My biggest success was definitely winning open doubles at the Tornado Worlds in 2006 together with Dave. Dave already won the open singles in 1995 but was never able to win open doubles. In 2006 we had the king seat in the finals against Frederic Collignon and Todd Loffredo – the best team to ever play foosball; it is not even close. Therefore, everybody thought we were getting smoked by them. But in 2006 we were able to beat them in the final. It was the best match I have ever played in my career. I scored 11 goals in 5 games; 10 from the back and one from the three bar. Dave told me after the match, that he would have killed himself, if we had lost that match (laughs). I can’t really remember a worst defeat. One tough loss was at a Hall of Fame Tournament where we had king seat in the finals against Fred and Todd and we got double dipped in six straight games. We could not win a single game against them. That wasn’t a joyful moment. However, I try to learn from those moments and afterwards I consciously try to forget them. This is something I also do within a game. If you do a mistake, just notice it and forget it afterwards. Negative thoughts can weaken and poison your game like almost nothing else. What common mistakes do you see people do? One thing I just mentioned. A lot of people dwell on mistakes and beat themselves up, even though it won’t get them anywhere. Another thing I see is, that if some people get up in a match, they take the foot of the pedal. They lack discipline while in the lead and have struggle to close out those “easy” matches. On the other side, some people give up to soon, when they are down in a match. A good example would be the Tornado Worlds final 2008 between Fred and Todd and Dave and me. At that tournament, we beat them for the king seat and Todd was playing forward the hole match. In the final Todd started as forward and we won the first game. After that Fred switched to front and won the next 5 games in a row. They won the first set and were up 2:0 in the second set and we were as close to get double dipped as it gets. However, we did not give up and we won the next three games and the title. It is always worth it to hang in a match and give it your best, even though your odds for winning might look awful. So, I guess you could say in general that a common mistake is, that people get too high or too low because of the swings of the game. If you look for that and work on it, your consistency will improve drastically. A perfect example is Terry Rue. A couple of years back he would start a match with so much fire and energy, so hyped up, that he had nowhere to go but down when the match continues. He peaked too soon in my opinion. Over the last years, he was able to control that energy better and his tournament results improved dramatically because of that. What are your favourite wraps? I use TTR Master Wraps. I use the thick ones, but don’t really care about the colour. I don’t care that much with which wraps I play, as long as I have any, because I can’t play without wraps. For example, I heard, that the Tony Spredeman Wraps are very good as well. How do you prepare for a big tournament? What does your training regiment look like? A good preparation would be to train every day up until a week before the tournament and then let your body recover. I always watched videos from the good players I had to beat in order to win the tournament. Especially players I typically struggle with. Tony Spredeman for example sometimes scores very well on me. So, I watch the matches and try to find a solution for that. A good inspiration could also come from other players. Watch videos from players, who have success against the opponents you struggle with. Important for practice drills at the table is, that they should not get boring. You have to find ways to keep them interesting, otherwise you won’t be in the same state of mind during the tournament and the training won’t help you that much. One important technique is visualization. During practice but also away from the table try to imagine specific game scenarios against tough opponents. Try to see, feel and hear the situation within your mind. See yourself defending and scoring against the opponents. In this way, you can build up a good intensity within your practice which translates better into the tournament situation. During a tournament, I don’t practice much. I try to stay as much off of my feed as possible. I keep track of my next matches and shortly before I have to play I start preparing mentally for the specific matchup. Then I go to the table and practice the shots I needed in the past against those opponents. I never rush into a match. I wait until I am warmed up, which usually takes me between 10 and 15 shots, then I get into the right mindset and then I start ready into the match. One strategy for those situations away from the table would be the mentioned visualization. This is something I really recommend to everybody. During a match, it is slightly different. There will always be moments, when you feel the pressure overcoming you. One important thing is, that this nervous energy definitely can make you weaker, but it can also make you stronger. Therefore, you have to find a way to play through it. You have to learn to control the nervous energy and make it to something positive. I try to stay positive and stay aggressive in those moments. There is not much internal dialogue, I just feel the situation and believe in my experience and my ability to win. Don’t be timid! For example, if a golfer has a negative thought during a shot, they step away and start over. This is something you can translate to foosball. As you see, I just deal with the feelings when they come, I even prefer being a bit nervous in a match. Then I can channel this energy to get hyped up and reach my full potential. You don’t want to be lethargic in a match, even though I am like this all day (laughs). In those situations, it sometimes takes something external like a close match or a rude opponent to wake you up. At a certain point in your foosball career it gets tougher and tougher to motivate yourself. For example, if I never win again, I guess I am happy with what I achieved. That is not always a good feeling. Of course, I try to motivate myself and give every game my best, but it is hard. That is maybe the most impressive thing about Fred. He won virtually everything over an impressively long period of time and still stayed motivated in every single match as it seems.